Honeybear Lane reached a milestone this week. We got 1,000 fans on Facebook! I promised you all a big giveaway once we reached this milestone so here it is!! I am giving away 30 puff quilt tutorials!! I have been working like a DOG getting ready for my Fall Line of products coming out August 31st!! I am so seriously excited for the items that will be in my shop!! I will have 8 designs immediately available in very limited quantities. I will have two of my most popular designs available in a kit form for you to make it yourself! and PS…Lots of new products coming to my shop in the coming year! I know you have been so patient, and I’m so grateful that you’ve stuck with me. Anyway, I will introduce the full line on August 31st, so stay tuned! 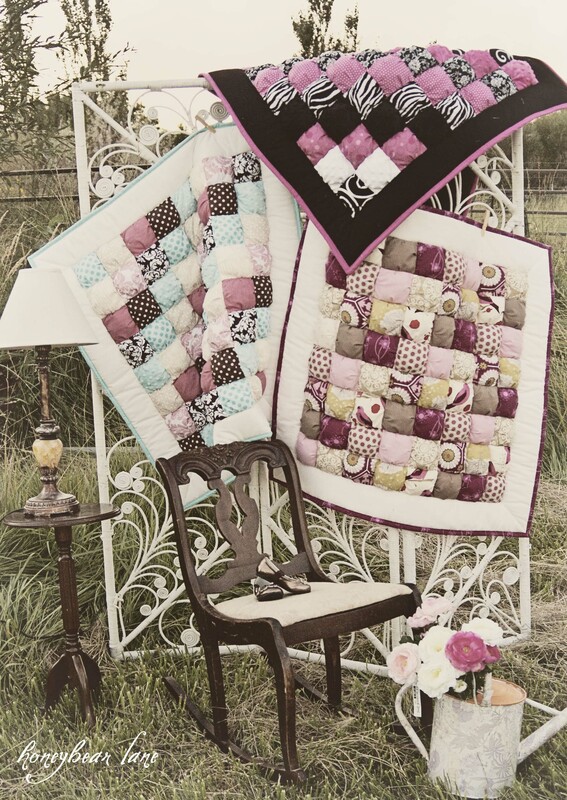 One winner will get their choice of Ziggy or Diamonds puff quilt kit! This giveaway will be open until September 2nd! 1st Entry: Leave a comment telling me what you love most about my blog and/or shop! 2nd Entry: Share this giveaway on Facebook or Twitter and comment back! As always, you must be a follower of the Honeybear Lane Blog! Remember that there will be 30 winners of this giveaway!! 30 chances to win!! Exclamation points!!!!! I love the variety of your blog – something for everyone and especially alot for me!! Love your blog! #1 – I love the creativity on your blog and shop… the puff quilts are my favorite, and I love your color and fabric choices! I love YOU Heidi!!LOL! Your blog is fantastic!! I too love the variety and your willingness to help others when they need it!! #2 – Shared on facebook. #3 – Like Honeybear Lane on facebook. #4 – Following on Pinterest. and tweeted! and shared on FB! My favorite thing about HBL is the photos for all the projects. They are so nice and clear its really easy to follow along. First found your blog because of the puff quilts… stayed because your blog is so fun! I “like” HBL on Facebook! I “follow” HBL on Pinterest. Love all the boards, especially the ones based on colors. I’m on a teal kick lately so that was a nice board to see! I love looking at all of the different puff quilts on your blog! Especially since the bright colors make each one so different. I love the creativity you share here with a little bit of your personal life. It’s a great balance! I love everything about your blog. And I follow you on pininterest. I love to look at the quilts! Thanks so much for the chance! I “like” you on facebook! Thank you! I love your quilts, the puff quilts especially. I love your style. Inspiring fabric choices and patterns. I am a new follower on FB. Sorry I didn’t help reach 1000, but here’s to 2000! LOVE your puff quilts! Very unique! I love the puffed quilt the best! That’s why I love your shop.. Your puff quilt adds dimension to an otherwise ‘ordinary’ quilt.. takes ordinary to extraordinary and I love that! I Like Honeybear on Facebook! Love the variety on your blog, your fabric choices, and really love the puff quilt! Brilliant! I was drawn here by the puff quilt, but I have stayed because of your kindness and generosity whilst starting your new business. I wish you the best and will promote you to all my friends! I already follow you on Pinterest, of course! Follow me back! I have been a fan of those puff quilts for a long time . . . I had bookmarked the tutorial at one time and came back later to reference it and saw that you had taken it down. Would love to win this one! Liked you on FB the other day! I LOVE the Puff Quilts. One of them would be perfect for a baby gift…. Every one I know is having a baby right now…. and I love all of your pins as well. I love how unique your ideas are, the puff quilts are so fun and make great gifts! Shared on FB so all my friends can join! Followed on Pinterest (I think) I’m still trying to figure that site out!! I love the way you mix colors in your Puff Quilts. They look sophisticated and cute at the same time! I love the inspiration you give for quilting. I want to get into quilting na dyou have lots of great tips on here. I love the puff quilts most..and sooo want to make one! from my blog onto Facebook, working on my own puff quilt now. Plus a shout out to you and your giveaway. I love the clean and crisp look of your blog, how easy it is to navigate, and of course all the inspiration I get from it. I love the colors you use in all your quilts! Just randomly found your website and wow! I’m in love with your beautiful puff quilts!! There’s a crafty person on the inside just dying to get out of me so your beautiful quilts are very inspiring! Would love to win a tutorial! Ok so I’m really going to try to win this time. I don’t know if I can make one of these quilts but I feel like I should at least try as a testimony to how awesome you are. So here is entry 1 – I am a HBL follower and I love your Monkey Onesie in your shop. It is extremely cute on and I wish E could still fit into his. Entry 2: I shared your giveaway on facebook! Entry 3: I like Honeybear Lane on facebook, of course. Entry 4: I follow you on Pinterest. Good luck to me! I love your style–the colors you use espeicially. I just love seeing your puff quilts. They make me swoon. I just stumbled across your blog when I saw the giveaway announced through a friend on facebook. Those puff quilts are to die for!!! I need one!!! Oooh, love the lighter version of the puff quilt you made Peyton. Adorable! I love most about your blog your Mommy stories and the home projects you do. Of course I LOVE the puff quilt and would love to win the ‘diamond’ quilt. Love your puff quilts and all the tutorials you are sharing on your blog! Love the ziggy quilt, my favorite! I fell in love with the puff quilt first when I saw them on make it or love it. Then when I found your blog I loved the variety and the fun personality your bring. Like you on facebook. Whoop! I fell in love with your puff quilts the second I saw them…. but Hot Chocolate is my favorite one of all!!! I of course follow you on facebook!!! shared it on twitter my friend!!! What I love most about your blog. All of your fun ideas!!! I love your quilts and the honest dialog on your blog. thanks so much for the chance! I would freak if I won the kit!!! 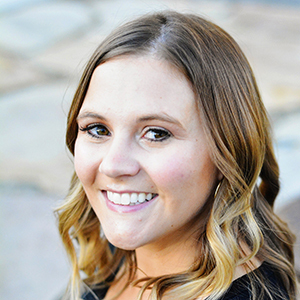 I love everything about your blog but especially your positive attitude! I love all of your beautiful designs! We are expecting in a little over a month and I would love one of your puff quilts to wrap our little one in. I’m a pretty inexperienced sewer but I am hoping to get better – maybe I’ll be making a quilt soon! I follow HBL on Pinterest!! I love Diamonds. It’s so sophisticated. I would give it to a mom I know. I found your blog because of your puff quilt tutorial. I love looking at the different quilts on your blog. I like HBL on Facebook. How awesome – 1000 fans on FB! I’m one of them. I follow you on Pinterest too – isn’t that addictive! You have great pics and fun things to share. Your blog is just so pretty to look at!! Follow you on pinterest, too. I love the quilts and the beautiful color combinations you use. So glad I found your site!! I love your site because you manage to break down the amazing things you create into simple easy to accomplish projects for us – AND – you do it for free and/or next to nothing!! Love your site – love the puff quilt tutorial (bought it about a month ago) – love your slip cover tutorial – JUST LOVE THE WHOLE SITE!! I shared this awesome giveaway on my FB. I really enjoy your blog mainly because I love your style and creativity. I love browsing your shop, just to look at all the lovelies. Liked Honeybear Lane on Facebook!! I love the Ziggy quilt! That fabric is way too cute!! You are very much Liked now on FB. and the thing that i like about your store and blog is the clean and consistent design. Hands down my favorite thing about your shop is how much love and thoughtfulness goes into everything you do! And your totally cute designs don’t hurt either. I now follow you on Pinterest, love all of your boards! I love your quilts, they are all so gogeous and cozy looking. I also love all the awesome tutorials you share here! I am following on FB!! I posted a link to this on my FB page! I have always loved your puff quilts!! I LOVE your beautiful quilt designs! Thanks for this giveaway! 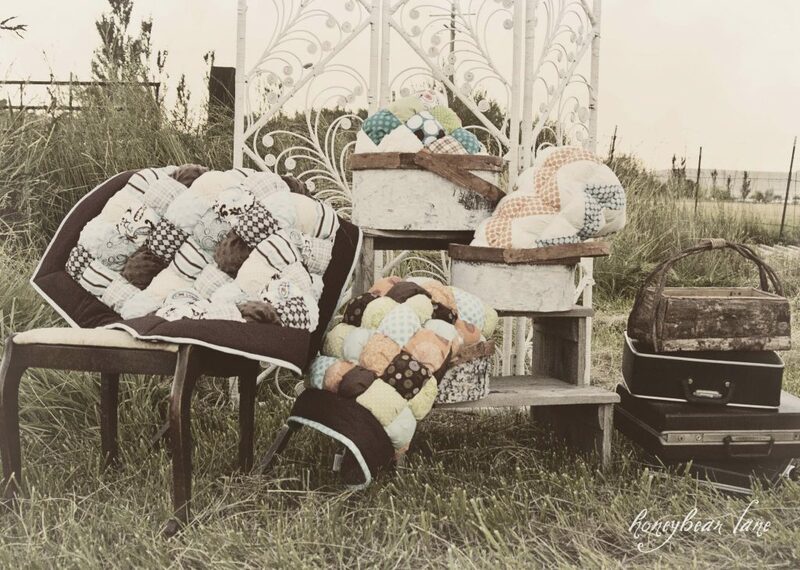 I love the beautiful color combinations and the puff quilts look SO cozy makes me want to snuggle my baby in one. I love the polka dots on the ziggy, LOVE!! I shared your giveaway on my Facebook page too! Just shared on facebook, excited to see all the comments from my fabric loving friends! You had me at the first site of your puff quilts! I love your darling puffy quilts! I shared the contest link on Facebook! I just discovered your site! I have wanted to make a quilt for ages, but have never been brave enough. I love the idea of your puff quilt, as it looks like it’s machine sewable, which is awesome! Yur page is inspiring me to dust off the sewing machine and give it a try! I love everything about your blog! You are so talented, I look forward to reading your posts & love your quilts! I follow you on fb. I love your puff quilts; they are so beautiful!! I have a new grandbaby that I would love to make a puff quilt. thanks for youru giveaway!! Well my favorite thing about your shop and site is your puff quilts!!! I love your fabric choices, your colors, your mix of patterns…it’s all so fun and cheery! Liked on Facebook!!!! 🙂 I hope I win!!!!!! I’m new to your shop and blog, but love your color sense! The puff quilts are lovely, and you’ve inspired me to want to make one. Congrats on you 1000 fans! I just became one more. I love your puff quilts! That’s actually how I found your blog. Now I’m glad I follow another mom of young’uns. It’s nice to know I’m not alone. I didn’t know you had a FB page! Yay. I like it! Wow!! I just seen your site Thanks to Flamingo Toes… and I have to say that i LOVE your quilts. They are nothing like what I have ever seen before. I guess when I think of quilts the first thing that comes to mind is like my Grandmother’s quilts.. (Old looking, and not any fabric choice that i would ever like). Your’s are AMAZING though. They are very modern, and I love all the color choices, The black/white/pink, or the Black/white/blue… They are Gorgeous! It gave me a completely different perspective about them. And I love that they are puffy squares. Thank You for sharing. 🙂 I also “Liked” you on Facebook too, and im lookinh foreward to seeing more of your work. Hi! I have NEVER seen such an adorable quilt! I love it! My favorite is the teals, blacks, and white! ADORABLE!! I just loked Honeybear Lane on FB!! Im sure I will be spending TOO much money here! I’m following Honeybear Lane on Pinterest! I tweeted your giveaway! Crossing my fingers. I love that you make kits for puffy quilts~ I would much rather buy that then do the work myself… :o)! Shared the info about your giveaway on FaceBook. 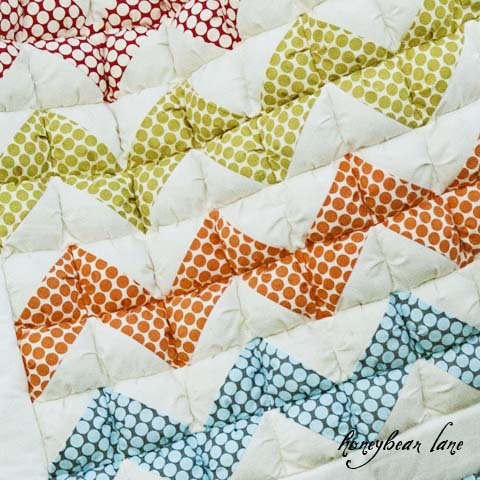 I am new to Honey Bear Lane and am so in love with your puff quilt! I hope I win! It’s the perfect quilt to make for my baby due in November. I am so excited to start following your blog and to explore to see what else you have!! I like Honey Bear Lane on FB! I love all the gorgeous pictures you have on your blog. So inspiring! Love your puff quilts…..especially the ziggy one! I can’t wait to buy the kit. I love your quilts! I especially love the puff quilts! I’ve done it a bunch since, and it’s so easy! I love that you keep updated! The vibrant colors and super fun designs! Heidi! – so excited to get a chance at a puff quilt tutorial! Im dying to try one since I dove into the quilting world! I love seeing the fabric you use to put your quilts together, and it always looks amazing! Ooh, I love your blog! You’re so creative! I love, love, LOVE your puff quilts! I love everything about your blog but I think the thing that pulls me back is you. It’s your kindness and your creativity. You have an eye for amazingness! I also E-mailed you once (like a year and a half ago or two years ago) and you were the sweetest person ever! I definitely felt like I had made a friend. I tweeted about your awesome giveaway!!! I love your blog! I also am always so delighted with your color choice combinations! What I love most about your blog are your quilt pictures. The puff quilts are amazing, I am in the process of working on one, but I feel like I’ll never finish!. And I adore the free motion quilt you just finished! I followed you in pinterest! I love your Puff Quilts!! They look so comfy and soft!! Great giveaway! Congrats on 1000 fans! I love that there is mommyhood humor and so much crafty goodness in one place!! I liked hbl on Facebook! I love your tutorials & your darling puff quilts. You are so creative & gifted! just found you, and am following on facebook! 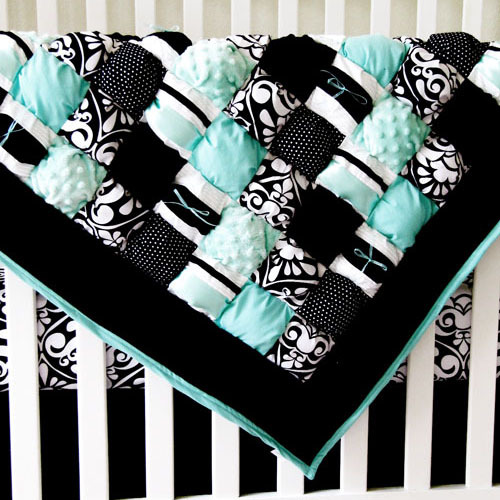 I am completely lusting over the teal and black puff blanket! I actually have a post ready to go about it for tomorrow! I just HAVE to make one for my little girl! #3 I am now following on Facebook! #4 I am following on Pinterest too! Honestly I just LOVE everything about your blog & shop! Your puff quilts are AMAZING!! I love the puff quilts the most! I’m especially excited to see more of that pink/black/white quilt coming this fall, love that color combo. Already LOVE Honeybear Lane on FB!! I follow HBL on Pinterest! What I love most about this blog is seeing how successful you have become. It gives me all sorts of friend pride when I hear random people talking about Honey Bear Lane and her awesome quilts. I get to feel all special by saying I totally know you and went to high school with you. Love the quilts – they remind me of clouds!! I love how talented you are and that you make even me feel like I can sew and get creative! My favorite thing about your blog is that you get just the right mix of tutorials, life, and sharing of other people’s things. I sure hope that sentence makes sense. I can only imagine what your life must be like right now so we are patient because we are excited! I am a fan on FB. Yay. I now follow you on pinterest and OMGOSH! I am very excited about that. I can’t wait to go back and look further! I love your puffy quilts the best. It is what brought me to your blog in the first place. Your crafts posts keep me coming back. : ) Great giveaway!! I love your blog! I like seeing your crafts and hearing about your family! I LOVE your puff quilts!!! How amazing to be able to make them on my own…although your color combinations and all the ones in your shop are so stinking cute!!! I’m also a follower of your pinterest boards and on Facebook!! I love seeing all your puff quilts on your blog! I love seeing the puff quilt idea in all the new modern fabrics, I’ll start following your adorable blog! Thanks for the great opportunity to win! I love all your patterns you are so creative! I shared a link to this giveaway on Facebook. I just love this blog. I look at it everyday on google reader and I love to see all the gorgeous quilts! I am now following you on Pinterest! So exciting! Love how visually appealing your blog is. I am now a FB fan! Love love love your blog. The puff quilt tutorials are fab. I love how unique this blog is from all the other ones. I’ve never seen puff quilts before reading your blog and now I want each one of the ones you make. You have an eye for design! I loves the puff quilt, so lovely! I liked your page in FB! I love love love your puff quilts! i think your puff quilts are gorgeous and i love the bright, fresh colors and patterns you use! I love your puff quilts and glamour is my new favorite! I shared your contest on Facebook to all my friends! I LOVE LOVE LOVE your Raspberry Bush puff quilt. I like honey bear lane on facebook. I follow Honey Bear Lane on Pinterest. I love the new quilts. They are gorgeous! I love the new taggie puff you posted recently. My baby would love something like that! I love the puff quilts, I have been looking at making one for my daughter…due to arrive in december and would LOVE LOVE to win one the tutorials! and I “Like” HBL on facebook! i am a follower of honeybear lane. I love, love, love these puffy quilts. They aren’t your grandmothers quilts! I love how refreshing your blog is- the colors, the posts, just everything! I always like seeing the pretty colour combinations you make the puff quilt in. I have thought about giving the pattern a try for awhile but am not much of a quilter so this would be a great trial sewing project for me! I like Honeybear lane on Facebook 🙂 I also like all the pictures you have on your facebook page! I like the layout of your blog and your tutorial page is awesome… at a glance I can find so many things that interest me, plus there is such a variety!1 Thanks! Following you on pinterest now too! Already happy to be a Facebook follower! Just shared this contest on my Fb page! Entry #1: My favorite thing about your blog and shop is, of course, the puff quilts! They are so cute and soft, and I really really really want one for my son, who is due to be born this December. Regardless of winning this giveaway I am planning to make one before he’s born…. but it would be so great to win the tutorial free (and a free qulit… I LOVE the diamonds quilt!) I’m a new quilter but so far have loved quilting and am looking forward to learning how to make a puff quilt. Entry #2: I just shared about this giveaway on my Facebook. Entry #3: I just “liked” Honeybear Lane on Facebook. Entry #4: I started following HoneyBear Lane (and all of your other pinboards) on Pinterest. I’ve been a follower of Honeybear Lane – I love this site! So many great colors, patterns and ideas! I recently discovered Pinterest – I’m now a HBL follower! Now the hardest entry – how do I narrow down to my favorite thing??? I love the puff quilts – I think my favorite is Sonrisa! I love those colors! I LOVE the idea of the puffy quilts.. they look SO cozy! http://twitter.com/#!/mrsprince1015 i tweeted about it! I’m following you on pintrest! I LOVE all of your different creative ideas!! Just posted the giveaway on my FB page. I really like your “lovey. You could also make a sachet with this pattern.” These products are all so soft and cuddley. Love them! I love the beautiful quilts on your blog and in your store. Especially the Blue and black diamond one! It’s beautiful! I’m following you on Pinterest! I love that place lol. I love the Raspberry Bush Baby Puff Quilt! I “like” your page on Facebook. (I now realized that I could separate all my answers – I put all my answers in one comment! …read…process… then write) My brain skips steps the more kids I have! Your quilts are so gorgeous! I wish I could give one to everyone I know! I love your creativity and your tutorials! I love seeing what you are up too. Awesome blog! I love your fun tutorials and interesting ideas with other things! Last minute entry! Tweet-shared your contest! I also follow HBL on facebook! I love your website and that cute ottoman you made! I also LOVE LOVE LOVE the puff quilts! So thankful a friend introduced me to your blog. LOVE the inspiration! JUST beginning to sew, but this inspires me to keep at it! Love the different designs and how cozy the quilts look! Not that I have TIME to make a puff quilt but I would love to pretend I had the time to make one before Baby #5 arrives (or honestly I’d probably make it and not get my room remodel done- love putting off the remodel…) What do I love about your blog… Honestly I love it all (can’t wait to see the new haircut) I love the personal posts, your so funny, as well as your amazing crafts. I love how authentic you are, that sometimes you posts lots, sometimes less, but don’t ever feel fake! I really love all of the color combinations you put together for your quilts! I really love your style, your color combos and pattern combinations are adorable! I am a new follower of your blog! Thanks for the chance to win too. I am following you on fb too. Thanks for the chance to win and inspiring me too! I found you on Pinterest and love your puff Quilts, I make a puff quilt for specials babies girls born in the family or closed friends, I maked for each of my three granddaughter. I love the colors you use! I’m totally jealous at your talent!!! I do make and sell them! Just check out the ‘shop’ link on the nav bar. I am almost sold out of my current quilts but you can email me specifically about making one. Thanks! Love everything about your site!! Keep up the great work! Love these puff quilts and can’t wait to make one myself They are so different from any other quilts I have seen. These puff quilts are so pretty. I love them. I Love your blog! SO many neat givaways and great tutorials! Just liked you on Facebook, I hope I can win!!! I love everything about your blog, you have the cutest stuff and I love the variety of everything! I am especially in love with the puff quilts! Love the fabrics and the puff quilts!! Your puff quilts are so cute, but what I love about them is your color choices. You have such a good eye for color! And I have my first grandbaby due in November, so I would love to win a puff quilt tutorial. Thanks for the chance to win one! Your quilts are so precious. They look so sniggly soft for my little tot. Can’t wait to see more!